This model from Samick proves that you don’t have to spend a small fortune on a recurve bow that is versatile and offers excellent performance at the right price. Samick is a Korean company, well known for the recurve bows it has been making starting with 1975. You can depend on the overall quality of this model, and you can rest assured that you’re getting more than your money’s worth. Available in various draw weights, and also sold along with a broad range of accessories, it is a good deal for the budget-minded shooter on the lookout for a good buy. That is always something you should check when you want to make sure that the bow you purchase will last and justify the expense for years to come. In this case, there are several aspects about the general construction of the Samick Sage that will convince you it is such a great deal. For starters, the riser is made from a combination of maple wood and olive Dymondwood. That mix grants it extreme resilience, and you will be able to subject your recurve bow to a lot of wear and tear without noticing anything troublesome about it. Maple wood is used for the limbs, too, but here, the material is laminated with fiberglass to ensure that they remain flexible and easy to draw even by a beginner. The term takedown means that you will be able to disassemble it. The even better news is that you can do so for this model without the need for special tools. You can remove the screws with just your fingers. Everything in this recurve bow was thought to offer convenience, and you will find it very manageable and easy to use. You will appreciate the fact that this recurve bow is quite compact. Seeing that there are other, smaller models on the market, that is still a plus, and you will like the fact that you can take it along with you in your adventures. You may notice that the tips of the limbs are reinforced with phenolic plastic. That happens to ensure that you will be able to upgrade the string, should the need arise. The Fast Flight strings available on the market are compatible with the bow. The total length of the bow is 62 inches, which allows you to send arrows at quite impressive distances. Overall, the recurve bow reviewed here has a beautiful, stylish appearance, and you will have no regrets if you opt for it instead of another model in the same price category. Not all the recurve bows on the market come with an arrow rest, which is why it is all for the better that this particular model offers such an extra, right out of the box. It must be mentioned that mounting accessories on this particular recurve bow is easy, as it has pre-installed brushings that allow you to do that. Should you decide you need a plunger, a stabilizer, or a quiver, you will find that all the bushings you need are there, as long as you come with the required accessories. 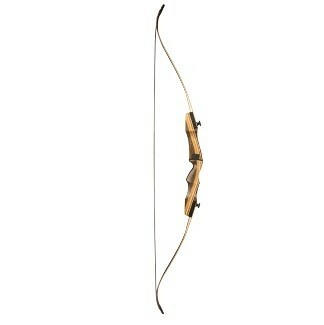 You will find this bow available in a large variety of draw weights, from 35lbs to 55lbs. You will only need to select the one that you believe can deliver a good job, depending on your skill and strength as a shooter. As far as what the bow can do, there are plenty of users who vouch that they used it for deer hunting, so, as long as you can draw 40lbs, you should be able to match their performance with one of your own. The larger game you can find in the woods, however, may require the use of a more suitable bow. There are, so far, no mentions from users that this bow might be noisy, and that is a great plus. Any prey, but particularly deer, must be approached with extra care, and making as little noise as possible is vital. While you may not expect the same fantastic performance from this model as well as from expensive recurve bows, it still does its job. In its price range, the Samick Sage Takedown is a good choice. It is resilient and made with good quality materials, so you will not have to worry about making the wrong investment. You will also like the fact that it allows you to pick from various draw weights, and that you can load it with accessories, should that be something you would want to do.